In collaboration with University of Zurich (ETH), Switzerland, KINEMATICA have developed a new generation of foaming machines in the MEGATRON® FM model series and introduced them into the market. The outstanding feature of our Foaming Machine is the generation of micro bubbles in the order of magnitude of 5-10 µm and their dense distribution due to our innovative rotor/stator geometry. The MT-FM models have flow rates in the range 10 – 4000 Lit/hour featuring Generator diameters from 30mm to 300mm. 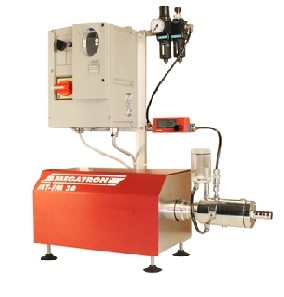 The extremely effective foaming machine MEGTRON® FM works continuously and is available in configurations suitable for laboratory, pilot plant and production areas of applicable industries. Scale-up starting from formulation using a few liters up to production is easily possible due to our application know how and different rotor/stator geometries. Two different rotor/stator geometries available in varying diameters and lengths. O-rings and seals from materials resistant to product matrix.